Passing by The Great Hall on his way back home to the secret Lizard Lair, Lucas's life feels a little less pitiful when he finally gets a positive response from "RooBarb" about an evening of board games and beers while checking his messages. 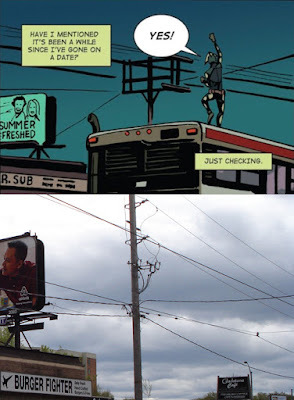 To celebrate an evening of successful crime prevention and the prospect of social interaction in the near future, the Human-Lizard gives out a cheer as the TTC bus he's riding on top of passes by Mr. Sub at 1181 Queen Street West, directly across the street from the Gladstone Hotel. The Human-Lizard on top of a TTC streetcar as it passes 1181 Queen St. W.
The Mr. Submarine located at 1181 Queen St. W. was a fixture of the West Queen West neighbourhood until 2013, when it was replaced by Hot Shawarma. In 2016, Hot Shawarma also began sharing space with Burger Fighter and have continued to offer both burgers and middle-eastern cuisine on their combined menu since then. Burger Fighter/Hot Shawarma at 1181 Queen St. W.
Up next: Lucas gives his parents a call and then tangles with a gang of beetle vikings on the back of a truck while cruising past Guerilla Printing on Spadina Ave.